Have you ever thought of how many churches have been lost during the last 100 years or so? The buildings, I mean. How many of these have been lost in the last century? Care to guess? Well, even if you are an expert guesser, you couldn't come up with an answer. 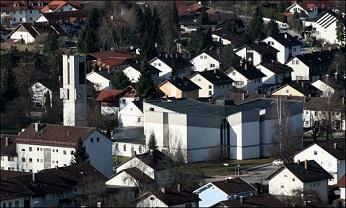 Wars, fires, decay, lack of funds, are among the attacks that have claimed many holy structures. Sometimes, we just decide we no longer "like" an old church building. Maybe it's too big to heat, or is on the verge of collapse. Maybe it's just not "modern" enough for the way we want to use it. Maybe not enough people attend any more. 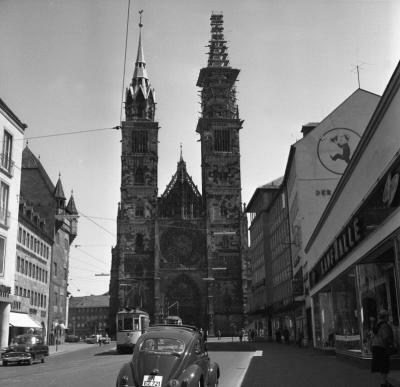 When I say buildings have been "lost," I include these churches that no longer exist as places of worship. Now they are apartment buildings, night clubs, museums, general stores, concert halls, and even skating rinks! My wife always says, "Well, at least they didn't tear it down!" And let's go one step further. What about abandoned and lost organs? How many of these are LONG gone? Some may have been "just organs" and yet others were irreplaceable masterpieces. Big or small, great or ordinary, they are still lost and can't be brought back. Maybe, like me, you know of places where organs were allowed to decay in order to facilitate their removal. After all, "the old thing doesn't even work any more," sounds like a great phrase to usher in the praise band. Sometimes, just tastes in organ style or sound is the reason for the death and removal of an instrument. The "type of music" that once dominated our worship is changing and disappearing. It would be a waste of money to spend it on the old organ, when nobody wants it anyway. Have you heard that argument? It's a sad fact that organs, like the churches that house them, are becoming an endangering species. The Steinmayer organ that now resides happily and safely in the St. Magnus Church in Marktoberdorf, Germany, almost suffered a fate of having it's voice silenced! For awhile, it was silenced, and may have remained so, but, as fate would have it, this is one that was spared, rescued, and now sings again in a new and loving home! This organ began its life as part of the organs in the Lorenzkirche in Nuremberg, and its life-story is a fascinating one! 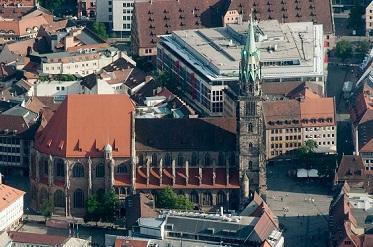 The St. Lorenzkirche is a medieval church of the former free imperial city of Nuremberg in southern Germany. It is dedicated to Saint Lawrence. The church was badly damaged during the Second World War and later restored. 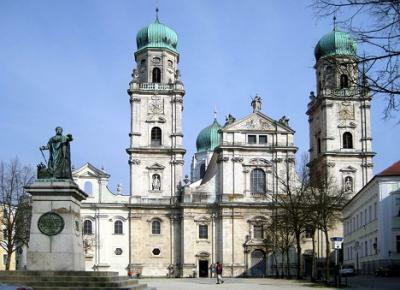 It is one of the most prominent churches of the Evangelical Lutheran Church in Bavaria. The nave of the church was completed by around 1400. In 1439, work began on the choir in the form of a hall church in the late German Sondergotik style of Gothic architecture. The choir was largely completed by 1477 by Konrad Roriczer, although Jakob Grimm completed the intricate vaults. In the choir one can find the carving of the Angelic Salutation by Veit Stoss, and the monumental tabernacle by Adam Kraft. 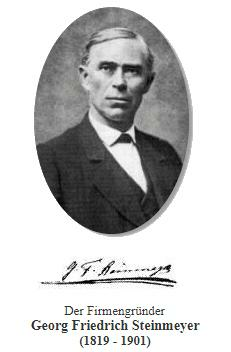 The latter includes a prominent figure of the sculptor himself. 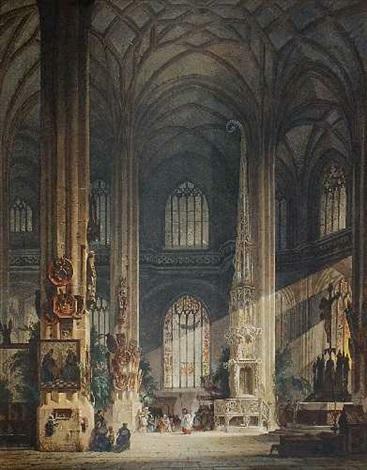 The building and furnishing of the church was cared of by the city council and by wealthy citizens. This is probably the reason why the art treasures of St. Lawrence were spared during the iconoclasm during the Reformation period. 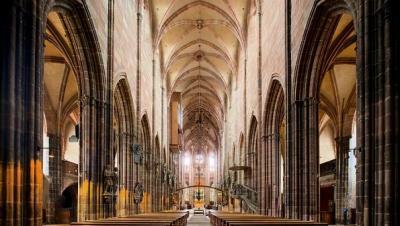 Despite St. Lawrence being one of the first churches in Germany to be Lutheran (1525), the wealthy citizens of Nuremberg wanted to preserve the memory of their ancestors and refused the removal of the donated works of art. The west facade is richly articulated, reflecting the wealth of the Nuremberg citizens. 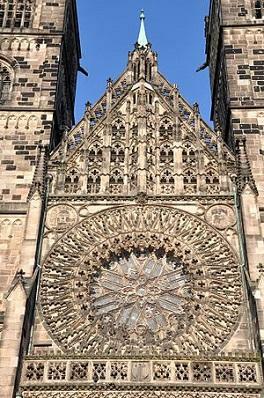 The facade is dominated by the two towers, mirroring St. Sebald (where Johann Pachelbel was organist) and indirectly Bamberg Cathedral with a sharp towering West portal doorway, and an indented rose window 9 metres in diameter. When I was a little boy I used to love to read my book, The Lives of the Saints. I still have it, and it's still in virtually immaculate condition, as I can't tolerate bent pages! Whenever, I do a Sample Set Spotlight, I like to check out and re-checkout the information about the patronal saint of the building where the organ is housed. In this case, I get to cover 2 saints - the one where the organ was originally, and the one where it is now! I confess that I didn't recall at that much about St. Laurence. It might have been because his "details" really aren't the sort of thing that you'd put into a child's saint book, but facts are facts, so, let's take a quick look at the life of St. Laurence, the parton saint of the grand Lorenzkirche where this organ began it's life. St. Laurence, the patron saint of cooks, is widely venerated, and many images of his martyrdom have been painted. 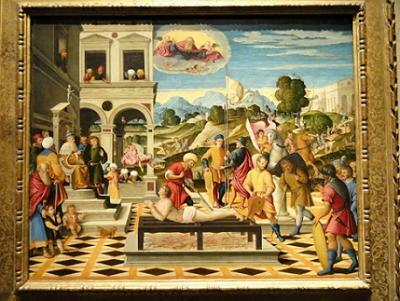 This particularly cheerfully-colored one by Girolamo da Santacroce of Venice, dates from the mid- sixteenth century. 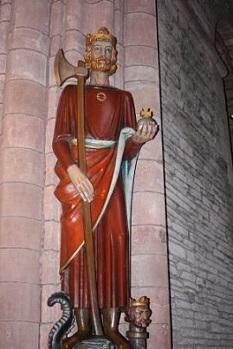 I was able to find out less about St. Magnus, the patron of the church that now houses the Steinmayer. It isn't that he's not an important guy, but that there are several saints with the name of Magnus! So, rather than guessing, and hoping that I "got it right," I'll just share a this image, and hope that maybe it is the correct one! The organ in St. Magnus in Marktoberdorf has an interesting history. 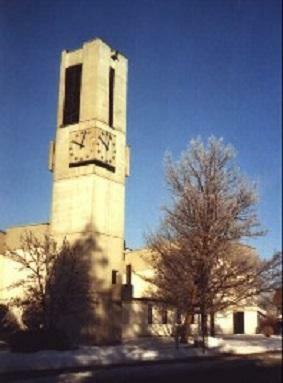 It was built by the reputed firm Steinmeyer in 1962 for the Lorenzkirche in Nuremberg, where it replaced the previous "Laurentiusorgel", which had been built in 1937 and was destroyed in the war. The building suffered extensive damage, but has been rebuilt and restored. The organs in St. Lorenz, of which there are three, combine to make a total of 162 stops, distributed on the Main-Organ, Laurentius-Organ, and Stephans-Organ. 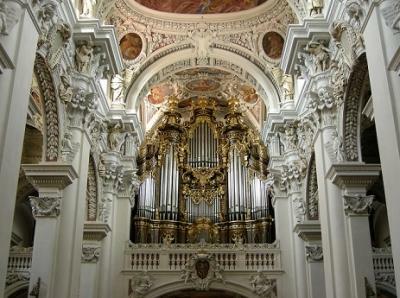 It is the second largest organ installation in Ger­many, outsized only by the massive organ in St. Stephen's Cathedral at Passau. When it was built in 1962 the new Laurentius-Organ however was considered not powerful enough for its intended function in the huge cathedral space. This resulted in several modifications throughout the years. 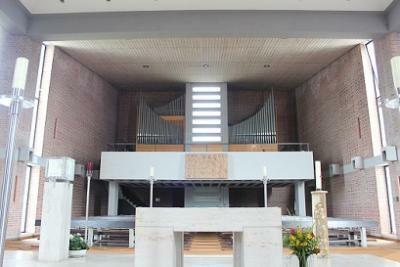 When the complete organ installation in St. Lorenz was renovated starting in 2004, the Laurentius-Organ from 1962 was abandoned and replaced by a new organ built by the Klais company. 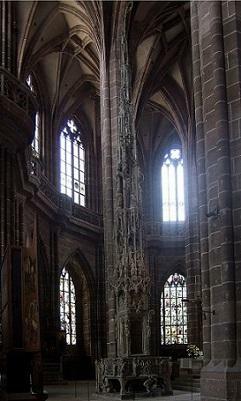 The main organ, also built by Steinmeyer, was restored and kept to a large extent. The Laurentius-Organ as well as the monumental historic main console were rescued from destruction by the Culture and Organ Center of Dr. Sixtus Lampl in Valley, Germany. The organ that concerns us, is the one that made its way to Marktoberdorf in 2008, where since then it is filling the St. Magnus church with its beautiful sound. 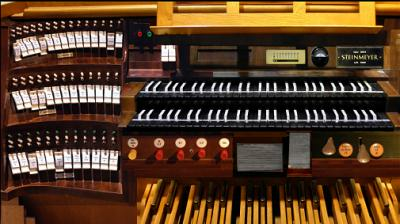 The instrument comprises 31 stops on two manuals and pedal, and could be played from its own console (still in operation at St. Magnus) as well as from the large main console. This main console is now on display in the Zollinger Hall at the organ museum in Valley as a living monument (see photo above). The special feature of this exhibit is that it is now possible to play one of the original organs from this historic console by using Hauptwerk and this sample set. While the size of the instrument is modest, it is still significant, and has many attractive colors in its tonal palette. The specification shows a complete sets of foundation stops, while a good mixture of mutations and mixtures add a nice "crown" to the overall effect. The action is direct electric, and the stop action is electric as well. So, let's take a look at the specification, and I'll give some sound demos in order to illustrate my opinions and ideas. The Hauptwerk is quite complete, and gives a good degree of flexibility. There are certain things that I wish were there, such as a 4' flute, but what is there works nicely. I suppose that one could also wish for an 8' reed in this division, but the Schalmey 8' from the Positif, when coupled in, serves nicely as a chorus reed, completing the full organ sound. The principal chorus is sweet, and not aggressive, and the mixture tops it off well without dominating it or making it top-heavy. The Positif is also a nicely spread divison. The flutes have charm and color, and the Quintadena has a lot of character. They also combine very well into a cornet, and are useful in providing a variety of colorful effects. 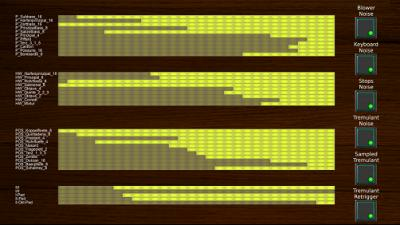 The Schalmey 8' is the big reed of the entire organ. It's light, trumpet-like quality works well in a number of scenarios, and the Bärpfeife 8' is sweet and gentle, getting a nice "shimmer" from the tremulant. If there is anything lacking in the Positif, it would be a "fuller" 8' foundation. The Prestant 4' is very bright, and while it's a good rank, it tends to dominate a bit, without the weight of a "rounder" 8' underneath it. The Pedal is "large" for an instrument of this size, although I didn't find much use for the various mutation stops, which seemed a little odd, especially for a relatively "small" organ. The reeds are good, and broadly enough scaled to not sound "buzzy" or hollow. I tend to like a "heavy bass," but my love for a "rolling bottom" is not always a good thing! In the case of this instrument, the pedal balances well, although I occasionally wished for a little more of this or that. That being said, it ALL goes together well. 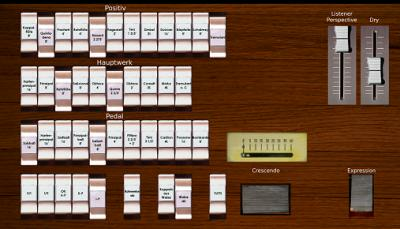 The organ does have a Walze / Crescendo Pedal, but I didn't use that at all. For one thing, except on big organs, such as an enormous Sauer, and music that demands huge and almost constant shifts in dynamics, as in some of the great Reger pieces, to me, crescendo pedals are for lazy organists who don't want the bother of learning how to change stops! Also, this organ is not "big enough" to need a crescendo pedal at any time - at least to my way of thinking! The Hauptwerk Prinzipal 8' has a warm, singing sound, which I think is well-shown in the Chorale Prelude on Wer nur den lieben Gott läst walten by Friederich Wilhelm Marpurg. You'll observe also that it sits nicely about the cantus firmus, played in the Pedal by the Bombarde 8'. Another chance to hear the Hauptwerk Prinzipal is in the introductory section of the Voluntary in G, Op. 5, No. 3 by the 18th century English composer, John Stanley. In this case, I've added the Rohrflöte 8' to the section where the cornet is playing. The sweet cornet, which is from the Positif, sounds and was very successful in this work. Speaking of cornets, this organ also has a bigger one on the Hauptwerk, and this one does very nicely in French classic literature, dialoguing nicely with the reeds of the Positif. These reeds, like many reeds, get a bit thin as you go up, but really have some nice color and bight in the register that you'll hear in this piece, a Duo by the great French organist, Louis Marchand. For another chance of hearing the Positif cornet, you can't find a better piece to show it then Bach's Nun komm, der Heiden Heiland, from the 18 Great Leipzig Chorales. The accompaniment/pedal is a mixture of the flutes, and strings, meaning the Salizetbass 8' in the Pedal. The plenum also has a nice, bright forte, without being shrill, thin or tiny. I did find that coupling in the Zimbel from the Positif topped things off nicely, which you can hear in the well-known Toccata in E Minor by Johann Pachelbel. This instrument is also capable of producing more "mystical sounds," as is evidenced in John Rutter's Te lucis ante terminum. In this performance, you're hearing the Koppelflöte 8' (with Tremulant) of the Positif, with the melody played upon the Hauptwerk Rohrflöte 8' and Salicional 8', also with the tremulant, and the Postif coupled to it. This sample set has "two tremulants" - a "synthesized" one, and the real one, which has been sampled. While the difference between the two is not immense, to me, the real one is better, and that is the one that you are hearing in this performance. I have mentioned before that there is a lot of "color" in this organ, and the Three Pieces from RIchard III by William Walton will show this nicely. The March features the plenum (no reeds), while the Elegy shows the unique sound of the Positif Quintadena 8' (with tremulant). This piece/sound was very effective and moving. The last section, Scherzetto, shows a nice combination of flutes and mutations, given a sense of sparkle and brightness to the atmosphere. The Trumpet Tune of David Johnson will demonstrate the sound of the reeds (from the Postif), in both solo and chorus roles. While I think the effect is good overall, I did miss more "ring and power" from the solo trumpet. I used both 8' reeds, filled out by the Koppelflöte 8' and Prestant 4', but it was still on the thin side, particularly as the note-range went higher. The always moving and heart-felt Herzlich tut mich verlangen Op. 122, No. 10 by Johannes Brahms sings sadly and sweetly. The manual parts are played Rohrflöte 8' and Salicional 8' of the Hauptwerk, and the Pedal uses the Bombarde 8' and Prinzipal 8'. I think that I also coupled the HW to the Pedal. The sounds, while not being "pure" German romantic, are sincere and effective, any "articulated" pipe speech not detracting from the overall whole. While I was in the romantic period, I figured I'd go a step or two further with a work by Felix Alexandre Guilmant, and another one by the great Englishman, Charles Villiers Stanford. While I was recording these, I was quite dissatisfied, and when I finished them, especially the Guilmant, I thought, "Well, THAT didn't work!" However when I listened to the playbacks, I thought both of them "came across" well, making nice musical points, if not entirely "authentically historical" musical references. In both cases, I was not able to follow the "registrational norms" for the piece at hand. Oraison in G, Op. 94, No. 2 by Guilmant, calls for the "typically French" sounds that simply do not exist on this organ. I chose, by necessity, to strive for "representative" sounds that would still work in making music. Here is one case that I really missed a bigger string or diapason under expression on the Positif. I also could not use the reeds, as there characteristics are different. All that being said, I still think that the sounds produced are dignified and "pleasant," although certainly not in a French way. While the Stanford piece, Chorale Prelude on the Song 'Why does azure deck the sky' also seemed "wrong" when doing it, but I admit that the playback came out nicely. I only used the Rohrflöte 8' and Salicional 8' of the Hauptwerk coupled to the Koppelflöte 8' from the Positif. I ended on the Positif with the tremulant on. (NOT English!) It really did surprise me, but the effect was not one that was displeasing in any way! As a conclusion, looking for a piece that would show good colors, range, and full organ, I went with Postlude by the Welshman, William Mathias. This splashy piece comes across with a good ring, and the sounds go together nicely. I did miss a real "Full Swell", a Solo tuba, and a big 32' at the end, but learning how to max-out the instrument at hand is not only a great lesson for the organist, but in this case, a very satisfactory musical outcome as well! The Steinmayer organ of the St. Magnus Church in Marktoberdorf is "different" from the type of organ sample set that I normally use. Many, even most of my uploads stem from the English cathedral tradition, where a large, 4-manual organ is needed to do justice to the particular style of music. However, that is not to say that I do not value or enjoy playing other types of instruments, and this instrument falls into that category. The sounds are clean, balanced, colorful, and often very satisfying. If you are like me, where you emphasis is often on extreme variety in sound and registration, you may be somewhat frustrated with this or any organ of this size. However, if you seek an organ that is cleanly designed and voiced, intelligently laid out, friendly to the user, and offers the chance to improve your playing skills, this may well be the organ for you! If you are looking to perform the complete works of Louis Vierne or Herbert Howells, you'll have to look elsewhere! However, if you want to be able to play a wide spectrum of literature with beauty and integrity, then I urge you to give this set a good look! Also, the price is VERY reasonable, and that is always a good selling point. The Hauptwerk screens are clear and easy to use, and give the played the chance to control the listening perspective, mechanical noises, use of "tremulant type," etc. The main console screen is very realistic, as can be seen a few pictures above. Each organ has strengths and limitations. Mastering the art of "using what you've got," and finding ways "around what isn't there" are skills that every organist must develop. This organ, while modest in size, has many possibilities to be enjoyed and explored. It will serve to please in delight in a wide range of the literature, and will produce clean and bright performances. However, it is not a "thunderer," and it's not going to give huge dynamic ranges, or produce kaleidoscopic effects. The quality of the set is unquestionable, and I encountered no bugs or issues. The value is also something that speaks in its favor, and, along with the many features that I have described and tried to demonstrate with musical examples, makes this sample set well worth your consideration! My THANKS to Pipeloops for giving me the chance to play and review this set. THANK YOU, Reiner! Like ALL of my reviews, the opinions are my own, based on my experience and are sincere and honest feelings about the organ and sample set being reviewed. That cornet IS sweet. Lovely article. Wunderbar!